A new government review of the federal tax system offers important clues as to why effective tax reform will be so difficult for Congress and the White House to achieve this year. The Joint Committee on Taxation review of the tax system shows how the mix between individual and corporate taxes has shifted over time. In fiscal 2014, individual federal income tax receipts were 8.1 percent of the gross domestic product, while corporate income taxes were 1.9 percent of GDP. 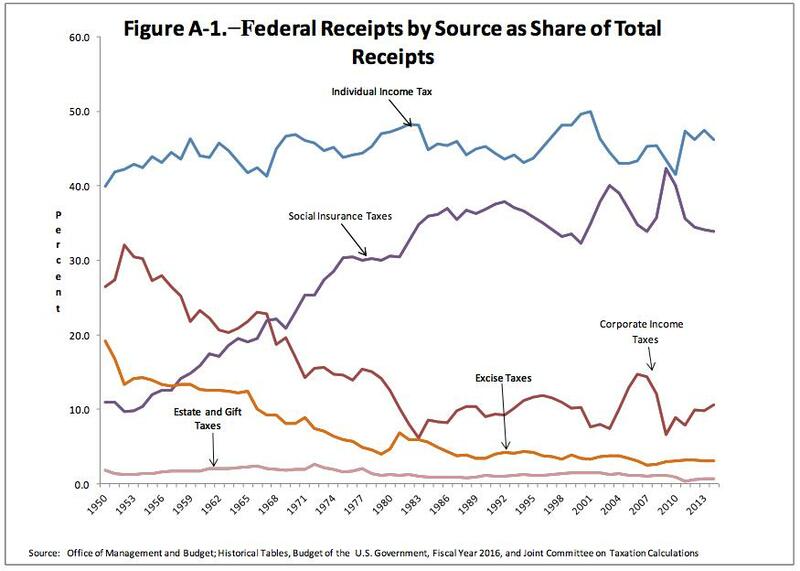 Indeed, individual income tax revenues provide nearly half of all revenue in the federal coffers and Social Security payroll taxes account for roughly another third. Corporate tax revenues contributed just 10.6 percent of overall revenues, or about a third of what they were in the mid-1950s. There are two important factors that help explain this disparity. The first is obvious: Despite the business community’s loud complaints that the U.S.’s 35 percent top corporate tax rate is the highest in the world, most companies have dramatically reduced their tax liabilities through tax breaks or sheltering their income overseas. The other factor that gets little attention is that more and more businesses have changed their corporate structure to become “pass through” entities, such as sole proprietorships, partnerships and S-corporations. In these types of operations, profits are treated as individual income for tax purposes and are subject to lower tax rates than corporate income. Business owners who take this route also don’t get hit with a second round of taxes on dividends and interest. According to the Tax Foundation, a group that advocates for lower taxes and a simpler tax code, the difference is substantial. Rather than paying a marginal corporate tax rate of 56.5 percent, business owners who file as individuals pay at a rate of 47.2 percent. The move toward pass-throughs has been substantial. In 2012, the latest year accounted for in the Joint Committee on Taxation study, 1.6 million U.S. corporate tax returns were filed, down about a quarter from 2.18 million in 2000. By contrast, there were 23.5 million returns from owners of sole proprietorships, an increase of 31 percent from 17.9 million in 2000. Today, 93 percent of all business ventures file taxes as individuals, according to the Tax Foundation. The tax revenue at stake is also staggering. In 1980, income from all so-called pass-throughs totaled less than $100 billion a year, according to the Urban Institute’s Tax Policy Center. By 2010, however, income from S-Corps and other pass through entities totaled $1.4 trillion and easily eclipsed income from C-Corps. Using IRS data, Urban Institute economist Joe Rosenberg found that in 2012, more than 9 percent of adjusted gross income reported on individual returns — nearly $850 billion — came from business income. “It’s really kind of changed the landscape, and it’s made the whole issue of what is the composition of individual taxes very different,” said Howard Gleckman, a Resident Fellow at the Urban Institute and an authority on tax policy. Gleckman and other tax experts say that this mass migration by businesses away from corporate tax structures should serve as a warning to President Obama and others: Tax reform that fails to account for tens of millions of businesses that file as individuals would be a serious mistake. Obama and many lawmakers advocate corporate tax reform that would lower rates and close loopholes and deductions. However, House Ways and Means Committee Chair Paul Ryan (R-WI) has questioned whether effective tax reform is possible this year if the individual income tax side of the ledger is left out of the talks. And that’s because such a huge chunk of individual tax revenue now comes from pass-through businesses. Kyle Pomerleau, an economist with the Tax Foundation's Center for Federal Tax Policy, agrees that tax reform will fall well short of lawmakers and the administration’s goals unless it takes into account this dramatic shift to pass-throughs.